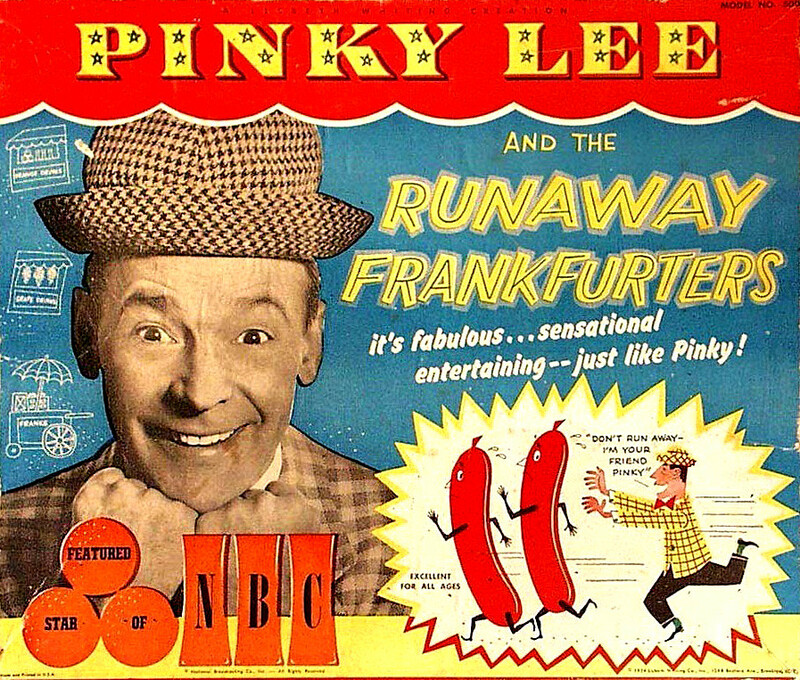 There were so many games that didn't need a prop, that were perfectly fun without needing to pull something out of a box. 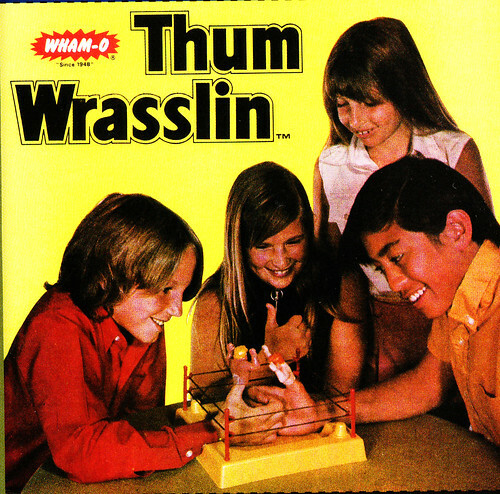 The Wham-O thumb wrestling game comes instantly to mind. 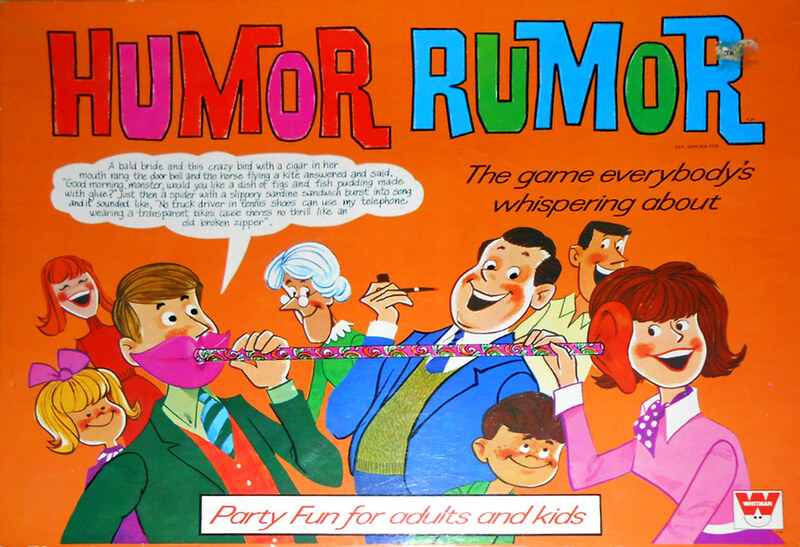 We used to do the rumor game at school without the need of a pair giant lips connected to a gigantic ear. 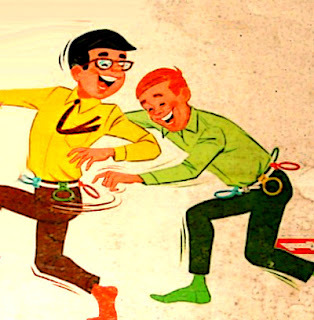 Each person has a belt with six colored loops. 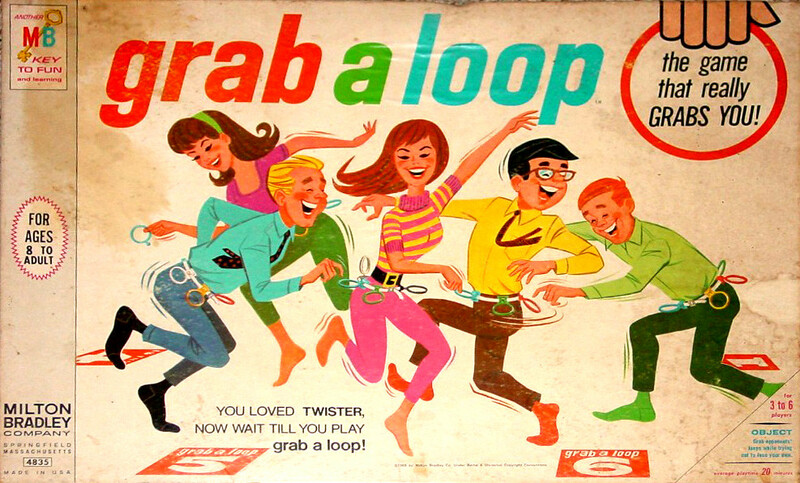 The object is to steal the loops from your opponents. You have to be in this circular arrangement, so there was no running around the yard in a game of cat and mouse. So, I'm kind of at a loss as to how this would actually be even remotely fun. Um. Yeah. Let's move on. Those sinister eyes you see at the top of the box isn't a photograph. He's actually in the box! 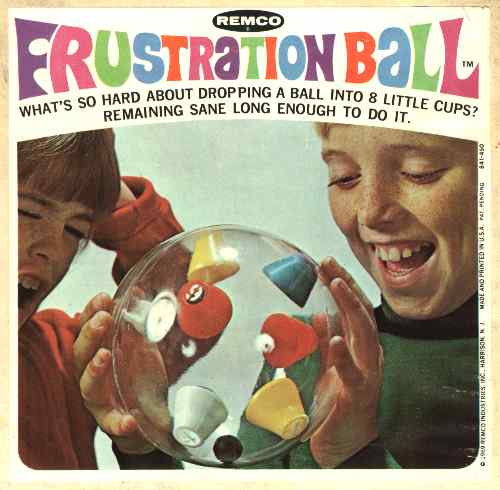 If you enjoy the Frustration Ball, don't miss Remco's new Despair Ball. And for a limited time only the Dark Night of the Soul Ball. 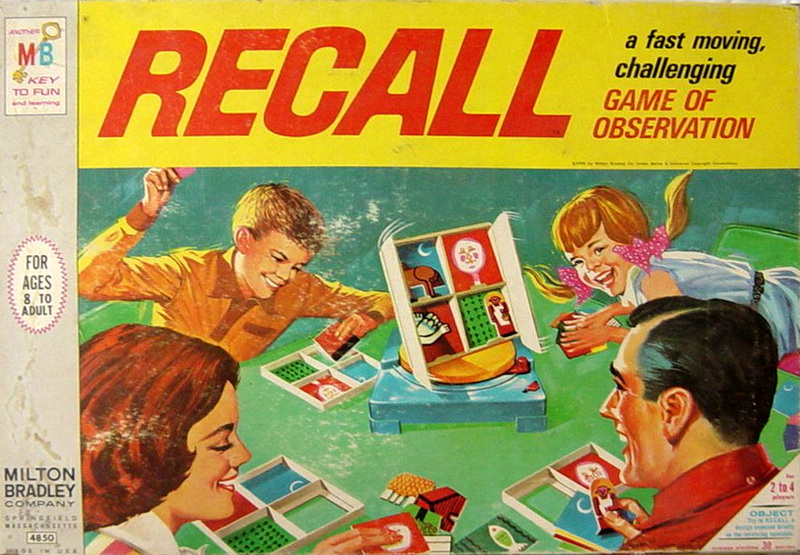 Fun for girls and boys but not politicians, who may or may not recall depending on what they stand to gain or lose. Comes with game board, dice, a deck of 52 game cards, rolling paper, and roach clip. 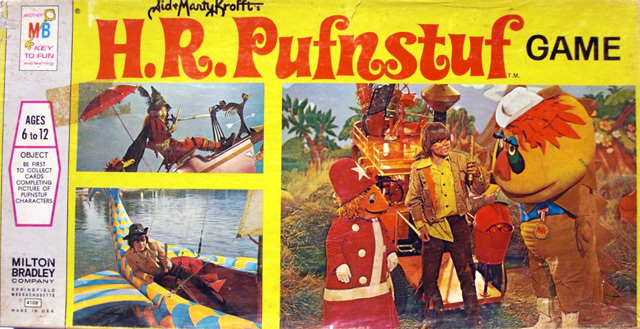 Marijuana not included. Would have been much cooler as a chess set. 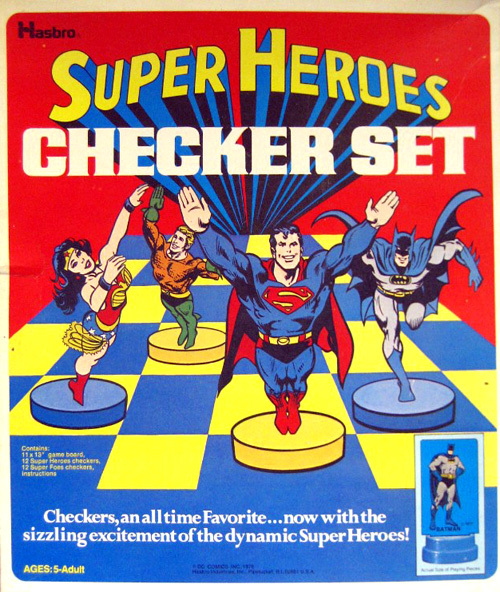 Instead it's just crummy checker pieces with cardboard superheroes wedged in. I hope they at least had some cool heroes to use instead of your usual standard boring fare. "Apache Chief for the win! Eh-neeek-chock!!" "Yes, but I don't wan't to know. I don't want to know if you are lonely. 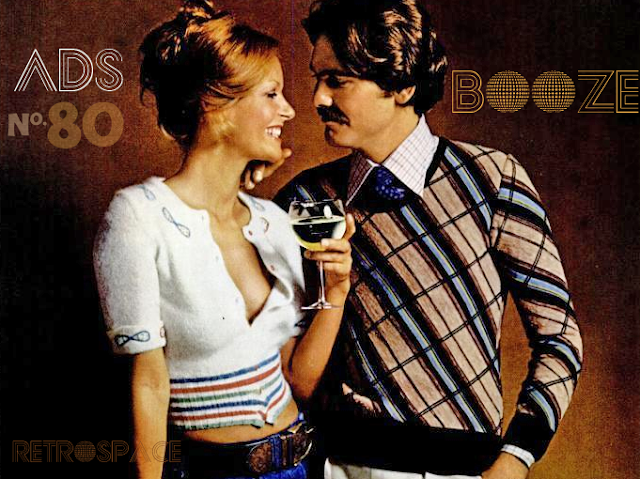 I don't want to know if you are less than lonely." Legend has it that a mysterious autistic Belgian fisherman has solved 129,999 of the mysteries, but there remains one even this enigmatic genius can't crack. It is foretold that whoever does it shall be the Once and Future King of Mankind. Believe it.... or not. I think the two male cottages are hitting it off, don't you? 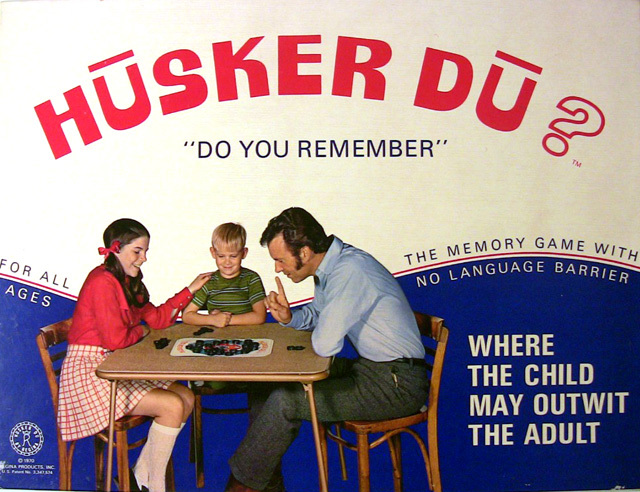 Some of Charles Nelson Reilly's mojo has rubbed off on this board game. Also, the host isn't phrasing it correctly. It shouldn't be "name a kind of cheese." It needs to be something like "Dumb Donald was kicked out of the grocery store when they caught him fondling the BLANK." 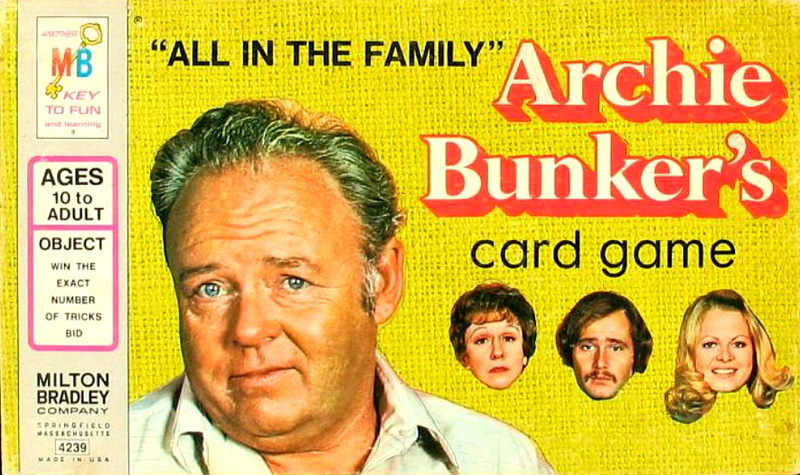 I just picked up that Archie Bunker game at a yard sale this past summer. 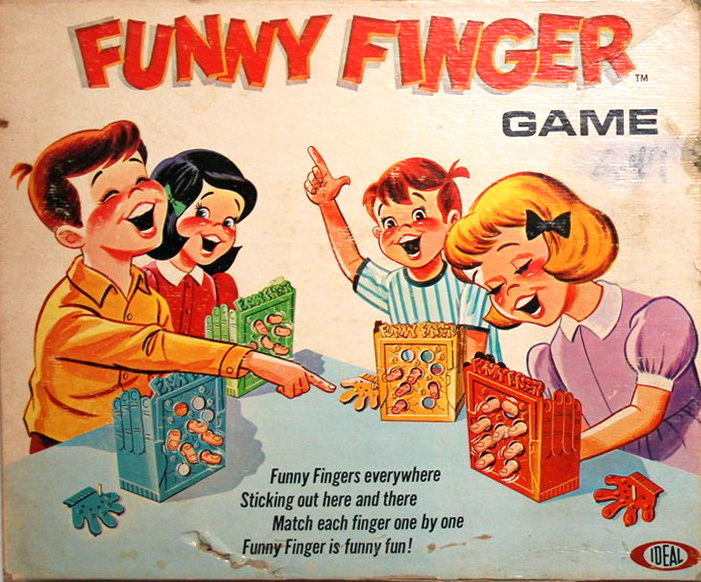 Tried playing it with my girlfriend once- It's REALLY lame. Still, a cool artifact. Well worth the five bucks i spent on it. 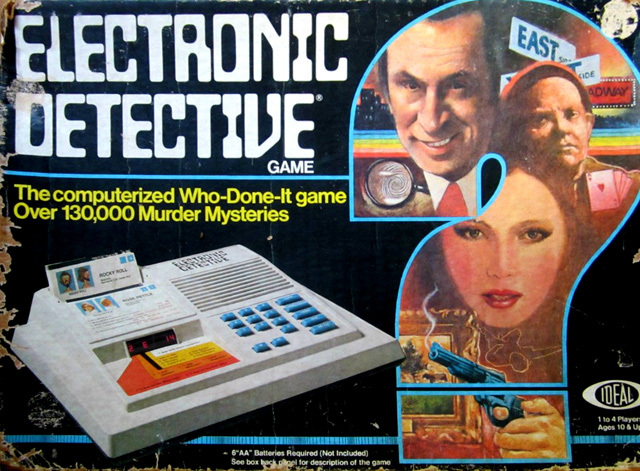 Why is a maniacal Don Adams on the cover of Electronic Detective? Because he's always on duty! 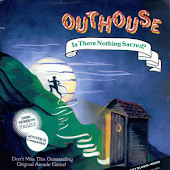 Don Adams was the spokes person for several Ideal games in the 70s. I've always been a sucker for reboots of timeless classic games,like the superhero chess set.In the 90's I splurged on the super fancy Universal monster chess set at Spencer Gifts.It makes a cool conversation piece at Halloween.Also a few years ago,Our Borders bookstore was going under,and having a clearance sale.For 99 cents,I got a Kong checker set with Kong pieces vs Vastatosaur pieces. 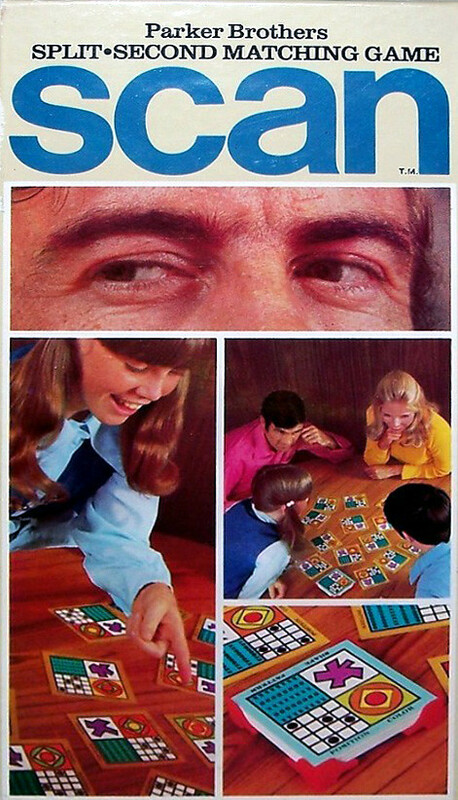 That is the 60s version of Match Game, which was as difficult and boring as the 70s version was naughty and fun. It is a wonder anybody ever won. The only thing that would make the game worth having is if it came with a 45 of the 60s theme song, "Swinging Safari" by Billy Vaughn. Somehow "Name a highway in the United States" isn't as easy for people as "That is the worst wedding cake I ever seen. 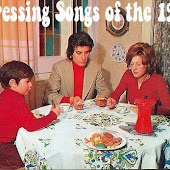 The little groom on top has his BLANK sticking out." 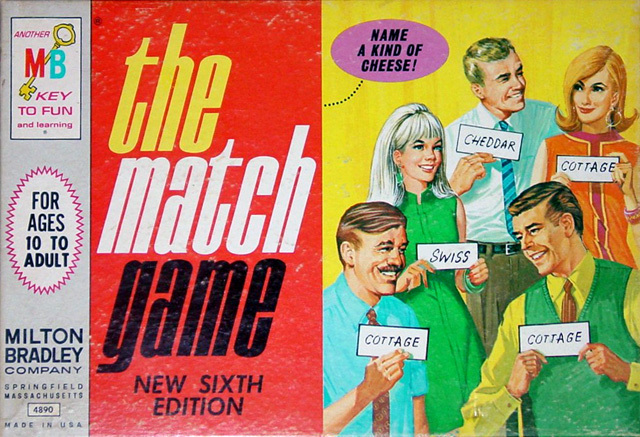 I don't believe that 3 of 5 people when presented with "Name a kind of cheese" would say "cottage". These are great! I have to drop in my own find of "Spin the Bottle" at a sale a year or 2 ago. 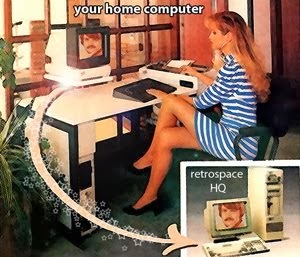 In these more PC times parents would have a cow over licensed merchandise from tv shows like All in the Family due to Archie Bunker's foul mouth. Puzzle games help children learn to work within a structured set of rules, kind of like real life.